Stuart explains: "Man is the spider monkeys greatest enemy. Besides destroying their habitat, man is also responsible for dragging these glorious animals into the lucrative pet trade." 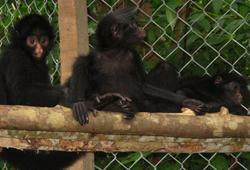 Projects Abroad has been involved in the rescue and release of spider monkeys over the last four years. We have also released other animals such as a tapir and a large number of native birds. So whilst you are sitting down to your turkey and Christmas pudding there will be five monkeys returning to the wild. Check out the Peruvian Conservation page for all the latest updates on the animal release programme and the rest of our conservation efforts in Peru.